Usually I create a product, finish everything, and then wait a few months before I can talk about it. In a rare (for me) turn of events, I can talk about a product early in the development cycle – in fact, in time to get your input. The product will be named “CCNA 200-125 ICND2 200-105 Exam Prep LiveLessons”, or similar. (CCNA EPL for short.) Interested in giving me some input on topics to include? Jump into this short post. Do you want to help, to offer an opinion, and maybe even change what I do put in the product, and what I don’t put in? Basically, we shoot for a set amount of video time. I can’t create videos for every possible mistake people might make, so we shoot for the most important: the most common mistakes, the most challenging, the ones that people tend to ask about repeatedly. Choose a specific idea related to those topics, not just the general topic. Tell me: what specific technology concepts are/would be the most likely to cause you to miss a question on the ICND2 200-105 or CCNA 200-125 exam? That said, if you only have time for a click… give your opinion here! Regardless, thanks for the help! 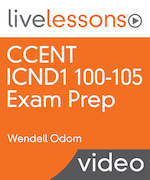 CCENT ICND1 Exam Prep LiveLessons – Huh?